We are so pleased to have Ron joining us to teach at the Center! 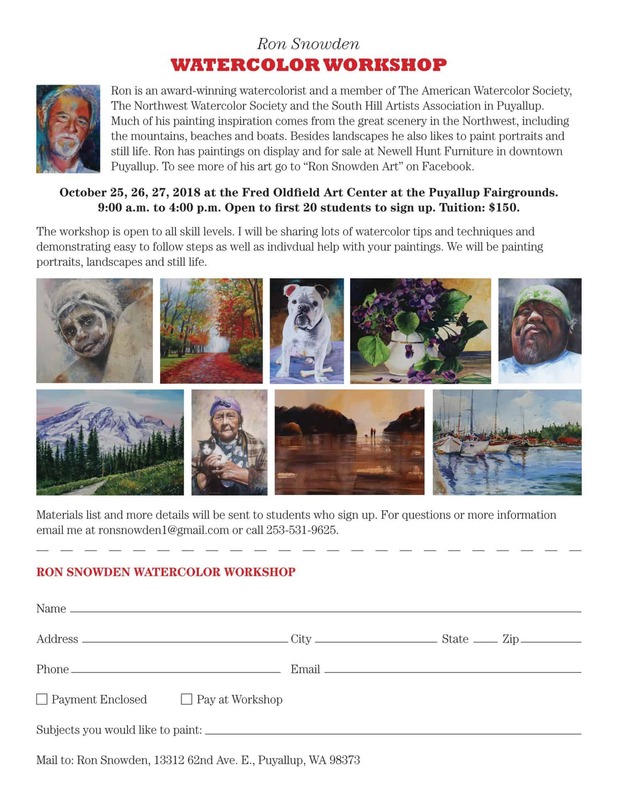 If you would like to learn more about the mysteries of watercolor Ron will be conducting a Watercolor Workshop October 25-27 at the Fred Oldfield Art Center at the Puyallup Fairgrounds. It will be for all skill levels with lots of demos and individual help as well. Portraits, landscapes, and still life. Open to the first 20 who sign up. Materials list and more details will be sent to students who sign up. For questions or more information email Ron at ronsnowden1@gmail.com or call 253-531-9625. Click on the button below to view and print the registration form.